The Grossular crystals from this location have been attributed as to coming from Lake Jaco for many years. This information is not correct as it was a deliberate attempt to conceal the actual locality from would be diggers. This piece is a good example of this material featuring sharp, well-formed dodecahedral crystals of pink and cream-colored Grossular measuring up to 2.3 cm across. 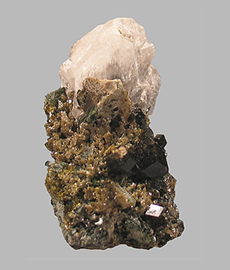 Also present on this specimen are several small crystals of Vesuvianite. There are several small areas of contact where it grew against matrix or another crystal. This specimen hails from a north-eastern San Diego County location that is known to have produced good-quality Topaz and Elbaite crystals. 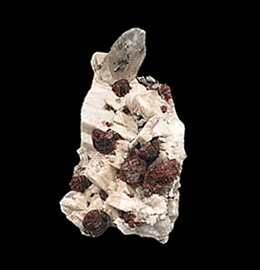 This specimen features two opaque, well-formed Garnet crystals perched on a towering matrix of Albite. 7.7 x 5.6 x 1.6 cm. A very gemmy specimen of Grossular from the renowned Jeffrey Mine in Asbestos, Canada. This specimen is covered in Grossular crystals, the largest ones measuring 1 centimeter. 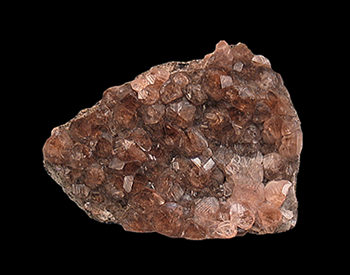 The color of the crystals varies from pink to peach to cinnamon-brown and changes color a little bit depending on the light source. With the exception of several small crystals on the crystals on edge of this specimen, all are water-clear with a great lustre. 7.2 x 5.3 x 3.6 cm. 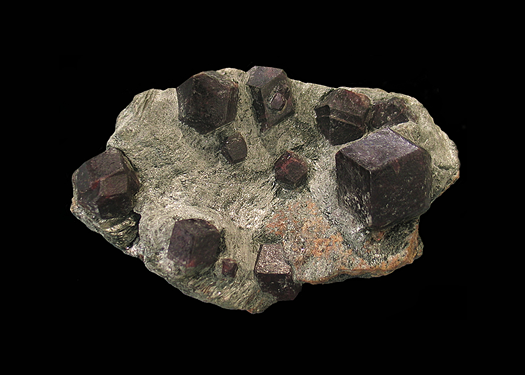 The Spessartines From Wushan are definitely in the upper echelon of Garnet specimens. For a good number of years Chinese Garnets have been quite abundant. But the really killer specimens have been too few and hard to come by. These gemmy Garnets have a luster that has to be seen in person to be fully appreciated. This specimen also features very clear crystals of Smoky Quartz measuring up to 4 cm in size. Another plus is the striking orange color, much like the famous Spessartines from the world famous Little Three mine in Ramona, California. A neat specimen from an interesting occurrence in Afghanistan. 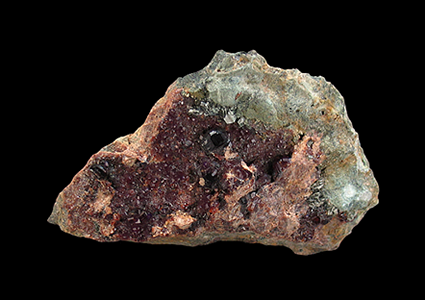 This specimen features a wine-red-colored crystal of Almandine on matrix of green-colored Clinochlore (Chlorite). Despite the fact that this province is incredibly well-known for its pegmatite minerals, these specimens are actually from a metamorphic deposit. This material is not seen very often and when it can be found, it is often mislabeled as being from Pakistan. 10.3 x 7.2 x 3.1 cm. This colorful specimen hails from the alpine veins of Val d’Ala, Italy. 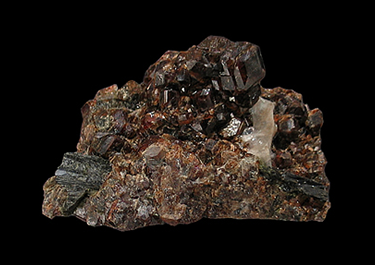 This matrix specimen is covered in glassy and gemmy, wine-colored Garnets, to .9 centimeters across. They are lustrous and sparkling, especially the smaller ones, and quite beautiful. Associated with the Garnets is the ever present (at least when it comes to alpine-type mineral deposits) Clinochlore which makes for a nice contrast of colors. 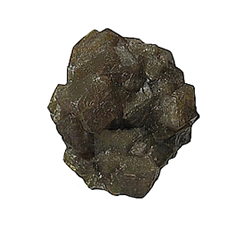 A single brown Grossular Garnet that is fully crystallized all around, except where it had been attached to matrix or perhaps another Garnet, on the bottom. The crystal has a great luster and has only a little bit of minor edge-wear due to alluvial stream action. An interesting aspect of this specimen that where the crystal is incomplete in the back it shows an internal green color. I'm not sure if if most or all of these Chocolate-colored crystals from Sandaré have this beautiful internal hue, but I was certainly surprised when I turned this one over. 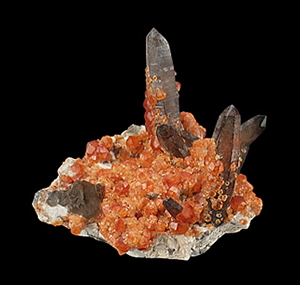 A translucent cluster of orange Hessonite crystals embedded in a nest of colorless, prismatic crystals of Diopside, some of which are almost transparent. The largest Hessonite crystal on this specimen measures 7 mm. 5.7 x 3.5 x 1 cm. This is one of the more weirdly-formed Garnets crystals that I have come across. 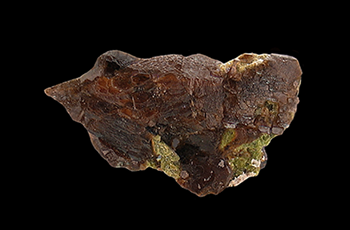 This specimen consists of a cinnamon-brown Andradite that looks as if it has been squeezed while it was forming and is accented by several small areas of pistachio-green Epidote. This uncommonly-shaped Garnet is 100% complete all-around, has no damage with a great lustre as well as some areas where it is transparent. Quite different from your usual Marki Khel Garnet specimen. 12.6 x 8 x 5.4 cm. 6.8 x 4 x 3.3 cm. 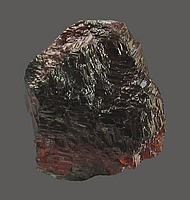 This lustrous garnet specimen hails from a former Tungsten-Lead-Silver occurrence that was worked in the late 1940's. 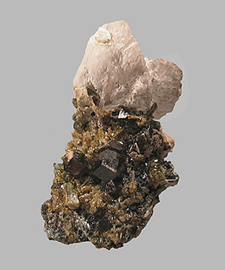 This specimen features two of the more common minerals to be found in a contact zone, Epidote and Garnet. A neat little specimen from a remote Nevada location. 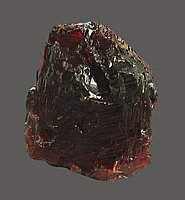 This specimen features many Spessartine Garnet crystals up to 1.6 cm. on a towering matrix of Feldspar crystals, crowned by a 3.6 cm. Quartz crystal. A great mineral specimen for a modest price if you ask me. 8 x 5 x 4.5 cm. 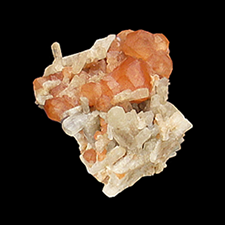 This specimen hails from a locality very near Sweden's most famous mineral locality, Långban. 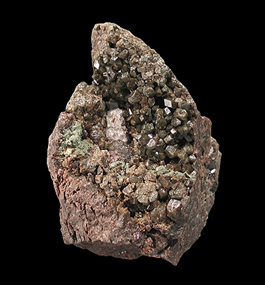 This mineral specimen features many lustrous, well-formed crystals of the variety of Garnet, Grossular measuring up to 6 mm. in size. A great locality specimen. 3 x 3 x 2 cm. An excellent cluster of well crystallized, greenish-brown Andradite Garnet crystals measuring up to 1.2 centimeters. The crystals on this specimen show a slight iridescence. This Garnet specimen was extremely hard to photograph and looks much, much more attractive in person. 5.5 x 3.5 2.7 cm. A refreshing change from the endless supply of red, Spessartine Garnets on their white Albite are these colorful Hessonite Garnet specimens. 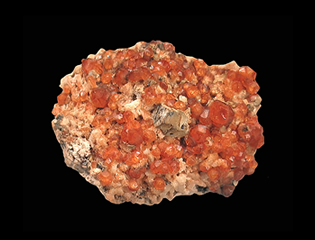 This specimen features a translucent cluster of orange Hessonite crystals on a pale, sandstone-like matrix. This find is relatively new, first appearing in the fall of 2009. 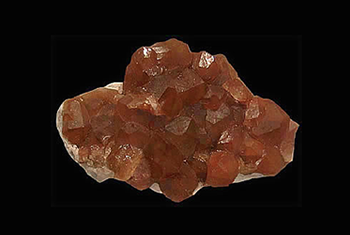 The largest of the Hessonite crystals measures 1 x 1 centimeters in size. 2.6 x 2 x 1.1 cm. This juicy-looking Garnet shows an amazing stepped growth pattern and is a complete floater. Although the photos don't convey it very well, this crystal is completely transparent, and would look good in anybody's mineral cabinet. 5.3 x 4 x 2.6 cm. These Spessartines are definitely in the upper echelon of Garnet specimens. For the past 15-16 years, Chinese Garnets have been quite abundant. But the really good specimens have been too few and hard to come by. I am very fortunate to be able to get these amazingly gemmy specimens from a lesser known Chinese locality. These Garnets have a luster that has to be seen in person to be fully appreciated. Another plus is the striking orange color, much like the famous Spessartine Garnets from the world famous Little Three mine in Ramona, California. 6.2 x 3.8 x 4.7 cm. A classic alpine-cleft-type mineral association.